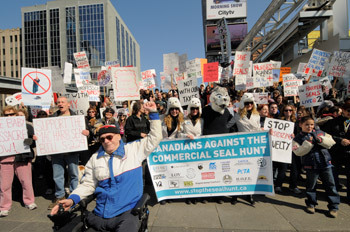 As the International Day of Action for Seals is upon us, this is a perfect time to reflect on the current realities of the Canadian seal hunt and appreciate just how far we’ve come in the past few years. Thanks to your support, the numbers of seals killed in Canada has plummeted in the past few years, from over 346,000 in 2006 to just over 40,000 in 2011. Demand for seal fur remains low, with processors reporting hundreds of thousands of skins still in stockpile and offering a meager $18 per skin last year. Markets for cruel seal products are drying up, as first the EU, and now Russia have banned the import of seal products, and a long promised agreement to send seal meat to China has yet to materialize. Commercial seal hunting is no longer economically viable. With a landed value of under a million dollars (CAD) last year, Canada puts far more money into trying to keep the seal hunt alive than it actually brings in. It is time for both sealers and the Government of Canada to take note: The world does not want to buy products from cruel commercial seal hunts. And yet they persist in denying this reality: fighting the EU ban on seal products at the WTO, working desperately to open new markets for seal products, and pledging support for a dying industry with little future. In fact, the best way to support the few fishermen still engaged in seal hunting is to help them get out of the industry. We will not back down. We will continue to work to educate the public about the cruelty of seal hunting and to close markets for seal products. It’s time to make the seal hunt history. Please take action and let the government of Canada know that it is time to protect seals, end the hunt, and take this opportunity to provide alternatives for sealers and transition them out of this dying industry.